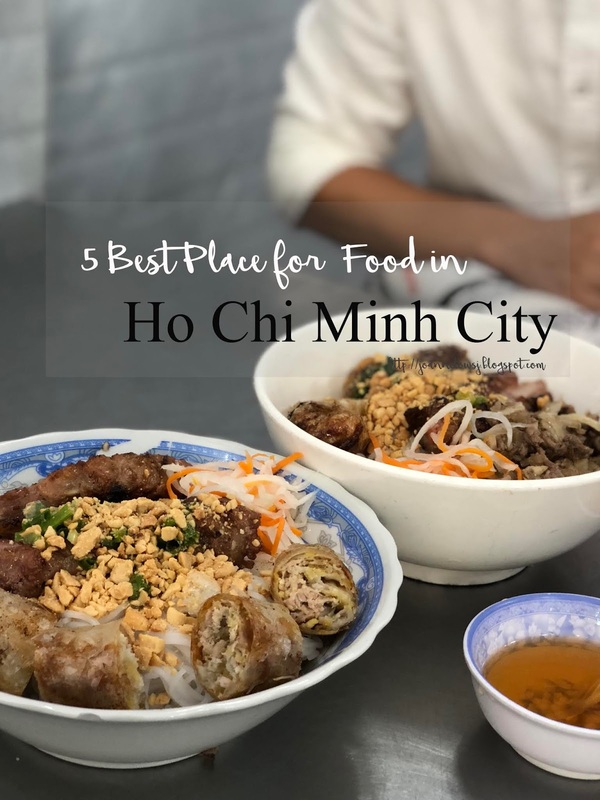 Home #foreverhungry Best Street food in Ho Chi Minh City ho chi minh city Itinerary Street food in ho chi minh city things to do in hcmc vietnam where to eat in ho chi minh city Vietnam 5 Best Street Food in Ho Chi Minh City! 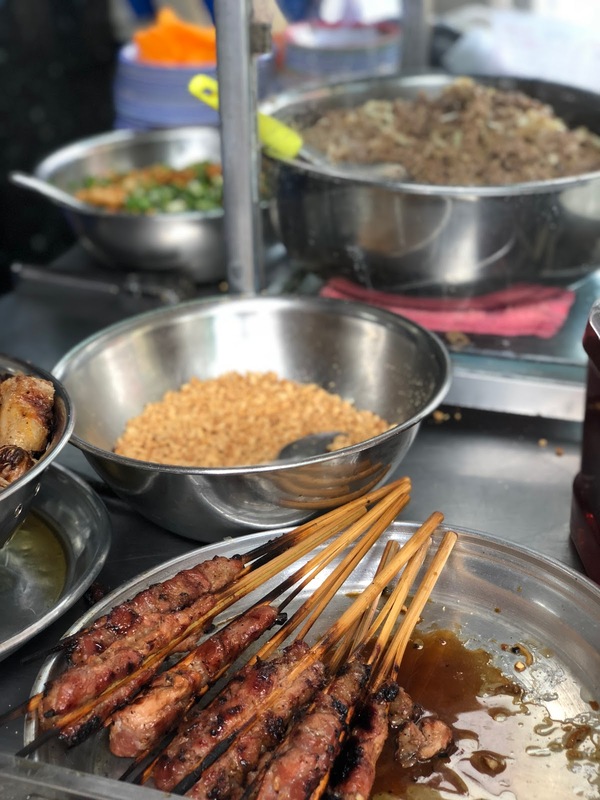 Vietnam 5 Best Street Food in Ho Chi Minh City! Before meeting H & Vietnamese friends in Singapore, I only know about Vietnamese spring roll and pho. Slowly, I started ordering Bun Thit Nuong instead of spring roll and pho. Throughout the 3 Day 2Nights in Ho Chi Minh City, we manage to explore a lot places (we still have a lot more not covered!) Nonetheless, below are my favourite place to eat in HCMC! For Some we even went back twice! There are many ways to determine if a Banh Mi is delicious. For me, the baguette got to be crispy and warm when served. Secondly, the filling needs to complement the baguette and cannot be too wet. Personally, I prefer grilled meat over tuna spread or ham. Thus, Banh mi 37 is the one I love after trying out a few Banh Mi in HCMC! Although, some people emphasized on the sauce used but I feel that most of the fish sauce taste the same. I’m glad H introduced this Banh Mi to me because it is really good! The Banh Mi is warm up on a charcoal grill with freshly grilled pork patty. The bread was crispy and warm! To top it off, there were with lots of cucumbers wrap in the bread, making it very crunchy and not too wet. 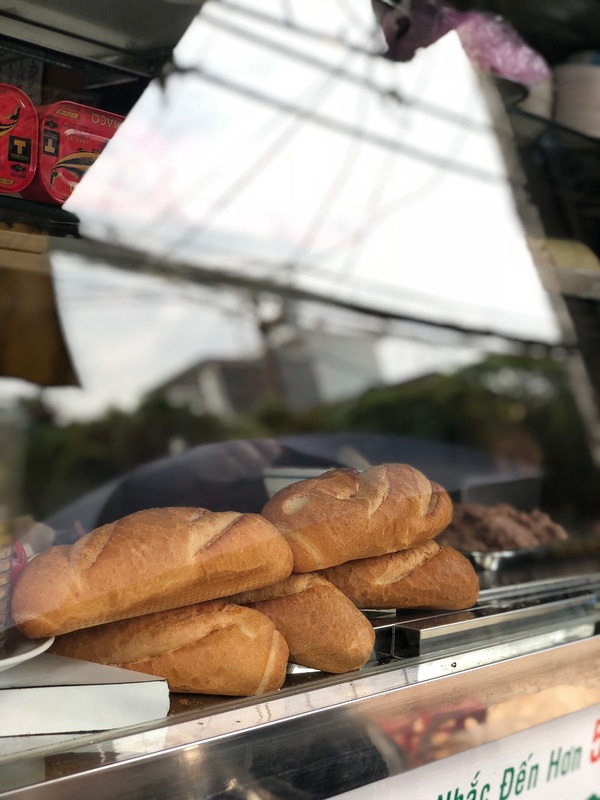 Located along the roadside in District 1, Banh Mi 37 looks just like any other street food except it can be very crowded during peak hours! H told me the first time he visited the stall he had to queue for 15-30 minutes for a Banh Mi. We were lucky during both night (probably due to the raining season), there were no long queues. Although the opening hour stated until 9pm, be there early! We manage to secure the last Banh Mi around 7-8pm! Needless to say, we went back the next day. Today, my favourite item to order in Singapore’s Vietnamese restaurant is Bun Thit Nuong. 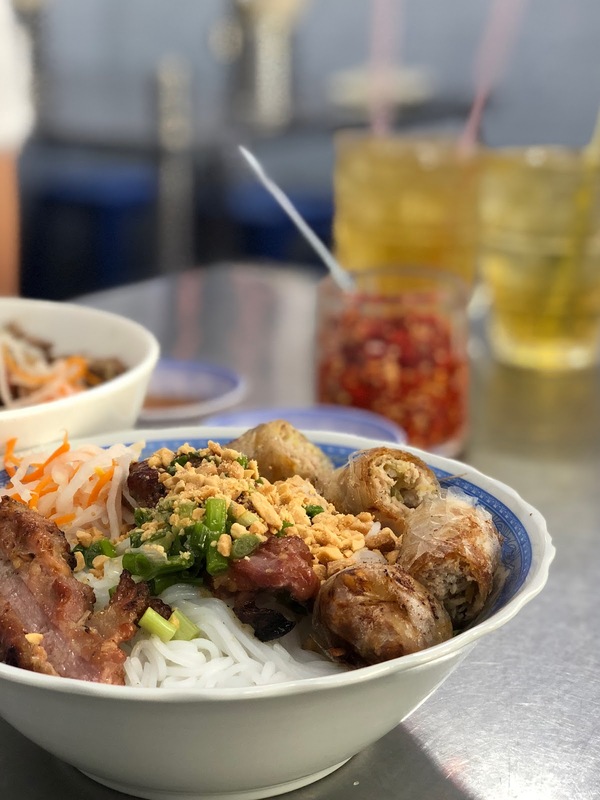 Bun Thit Nuong is a type Vietnamese rice-vermicelli noodle top with grilled pork, fried spring roll and fresh vegetables. The noodle is serve with fish sauce and cold. So i thought it is very hard to go wrong with rice-vermicelli noodle and grilled pork. Sadly, I was wrong. Some Vietnamese restaurant in Singapore can still serve pretty bad Bun Thit Nuong. H found this local eatery that serves excellent Bun Thit Nuong! When we walk in, we saw a man grilling the pork patty & it smells good! Although abit reluctant to share with H, I had to. There were too many things to try in HCMC! When the bowl of Bun Thit Nuong arrived, it looks really good! The rice-vermicelli noodles are smooth and silky. Pork was well-marinated but not too sweet! Plus, the grilled pork was warm, tender and juicy! The fried spring roll is crunchy and not too oily. Together with the fish sauce, the bowl of Bun Thit Nuong is the best I had! So glad, that it taste as good as it looks! Yum! Vietnam is a coffee haven and you can find traditional Vietnamese coffee everywhere – Dripped coffee with or w/o milk. We ordered ice coffee everywhere we go and they all taste pretty much the same. The coconut coffee style originated from Hanoi. Unlike the traditional coffee, Cộng cà phê serves coffee with coconut and condense milk. The coconut used makes the coffee more creamy. Personally, I am not a coffee expert but I like my coffee to be creamy and not overly sweet. Plus, its ice-blended! Perfect to cool ourselves down in the hot weather! We went back for the ice coffee twice! Although the price is a little steep and portion is small, we enjoyed our time there. Banh Mi Hoa Ma has 2 item on the menu – Banh Mi Kep Thit (30,000 VND) & Banh Mi Op La. 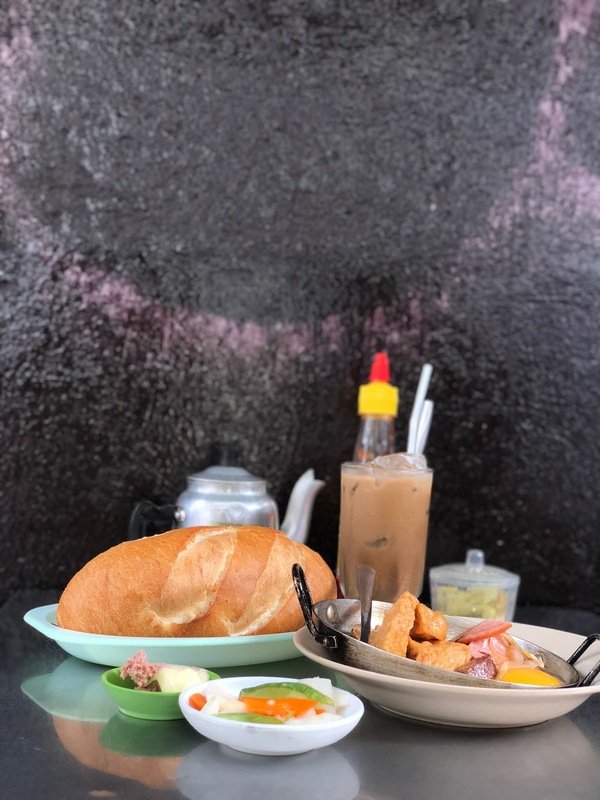 Unlike the normal Banh Mi we had on first day, we ordered the one with a egg dish - Banh Mi Op La. It looks like a “ Big Breakfast” to me. The set comes with a plate of egg, ham , fishcake and caramelised onions! You can add the chili sauce if you like it to be spicy! The baguette is really crispy on the outside and soft in the inside. We didn’t put everything together as a sandwich. Instead, we dipped everything with the runny egg. Somehow the dipping version turn out to be pretty good too! I can’t decide which one I love more – Banh Mi Hoa Ma or Banh Mi 37. Thus, I’m going to revisit this 2 place again! The downside of this place is the price. 52,000 VND for a Banh Mi is considered expensive in HCMC. However, I think most people wouldn’t mind paying a little more for a good Banh mi. I don’t know why but the grilled pork in Vietnam is really good! Looking through the food I had in HCMC, they are all mainly grilled pork chop! Never got tired of pork chop in Vietnam! Even before flying back, I wanted to have another slice of grilled pork chop! Thankfully, H found Cơm tấm Ba Ghiền and it happened to be along the way to airport. We order the pork chop set that comes with grilled pork chop, vegetables and broken rice. The broken rice is covered with a huge size of grilled pork chop and over flowing sauce. I love how tender and juicy the pork chop is! Plus, having it with rice definitely helps to subtle the sweetness of the sauce. Personally, I prefer the normal rice than the broken rice (Probably cause I was too used to eating the normal rice!). Before vising Cơm tấm Ba Ghiền, we read that Hygiene might be an issue. Honestly, I think the hygiene for street food is pretty much the same. It isn’t as bad as what I thought it would be. So, if you have no issue with street food’s hygiene, give this place a try!